I recently purchased a pair of very old, heavy Wedgwood candlesticks from a local estate. They are impressed with the Wedgwood signature mark on the bottom of each candlestick. On one candlestick there are cameos of George Washington on one side and his wife on the other side. The second candlestick has cameos that may be Thomas Jefferson and his wife. The Wedgwood candlestick colors are predominantly brown, teal and white. 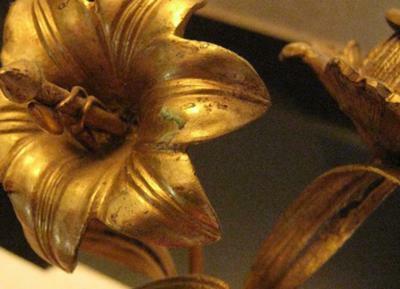 The 4 candlestick holders are part of a design of flowers and leaves. Other decorations include Greek keys, and tiny rams’ heads. 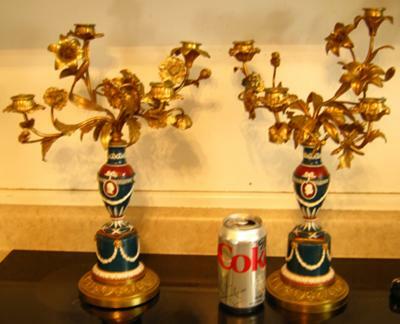 The base is gilt metal as are the candle holders, flowers, and leaves. Other than being Adams-style, we would love to know how to describe them accurately. Are these Wedgwood candlesticks enamel painted? Are they Majolica? Can anyone estimate an age or an approximate value? Condition-wise, they look to have one broken or missing leaf on the metal portion, and one of the cameo busts has a small area of loss on the bottom of the medallion. Can someone please either identify them or connect me with someone who can? I would be happy to provide more pictures and would greatly appreciate any assistance you can provide.